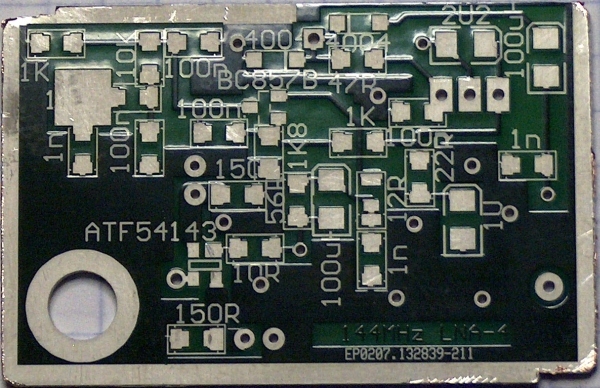 PA3BIY 144/432 LNA PCB/ATF54143 ordering. All Kits now gone, no more available - sorry! Please do not send money - I won't return it and I cannot send you Kits! When I first saw the article in Dubus 1/2002, I was very impressed with the data and quality of the construction. 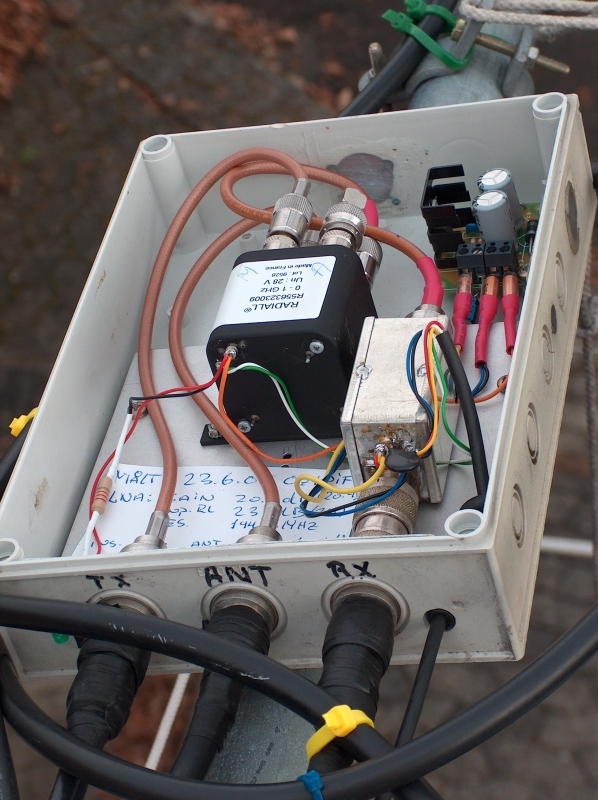 I managed to get hold of one of PA3BIY, Peter's PCBs, and built an LNA more or less from his description, although it only got an aluminium house from the junkbox to live in. To my great surprise it measured as well as, or better, in all respects as the published figures. After a few months of usage by me, I needed one more, and as there was considerable interest from members in my local ARC to build their own copies of this construction, a minor redesign was planned. Based on my experience, I wanted a somewhat smaller PCB lay-out that would fit in a tin-plated "RF-Tight" standard enclosure 55x37x30mm, instead of the superior but rather bulky and expensive milled block of aluminium that Peter used. Steen, OZ3SW undertook the PCB redesign, and 50 were made professionally, and kitted out for members to build. It was a roaring success, with the exception of a few soldering problems and a couple of killed ATFs all copies worked and exceeded original specifications. 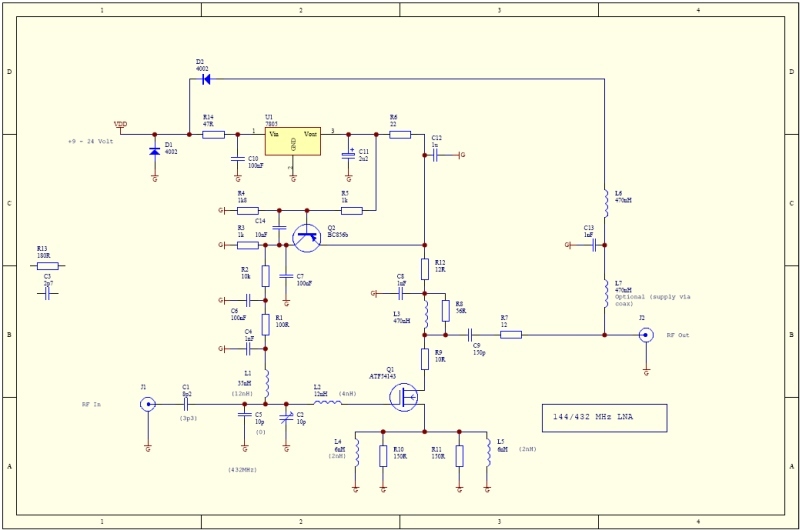 The same Steen decided that the design ought to work on 432Mhz with just a few changes, and built a quick prototype to prove this. It turned out to have excellent figures of merit, and as expected spurred a new round of demand for kits, which were then fulfilled in short order. This second batch was also quickly sold out, and has been out of stock for more than a year now (10-2006). 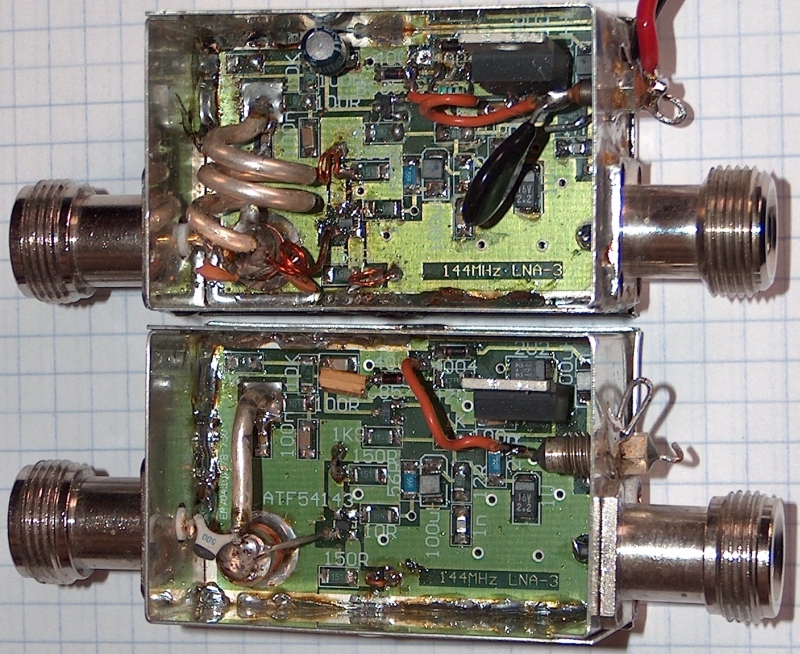 The two versions with the 144MHz on top and the 432MHz LNA at the bottom. 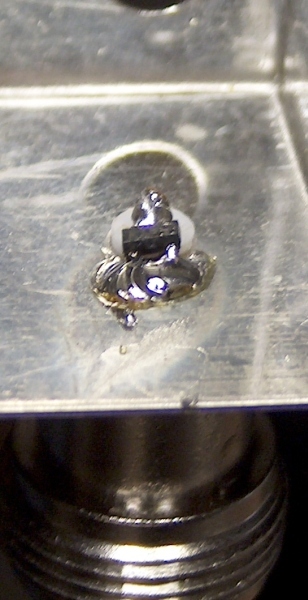 The large black component in the 144MHz version is a MOV in an attempt to combat possible lightning induced failure. A few pundits have declared that these data are theoretically impossible to achieve with this design, to which i can only comment that: "If the theory doesn't fit repeatedly and independently observed data, then the theory is clearly wrong, and needs to be replaced"
Note: R13 and C3 are not used in our version, and some other non-critical components have different values! You can get a high-resolution version i PDF format by clicking on the picture above! From PA3BIY, Peter: "I forgot something that is worth adding. Over the past years I have had some complaints about the sensitivity of the LNA for Static and (too much) rf power. I have come up with a simple solution, that does not degrade the NF significantly (0.05 dB or less) and has minor influence on the IP3 behaviour: 2 PIN diodes across the input. Normal fast switching diodes will obviously ruin the NF and IP3 properties, but PIN diodes act like a variable resistor, instead as a Clipper! If you look for the data sheet info, there are some references to PIN diode clippers. I have used the HSMP-3822-TR1G with success. They are about 1 Euro each (Farnell for example). The IIP3 properties remain practically unchanged until the RF input signals reach -30 dBm or so (I do not have the exact figures at hand), then the IP3 properties degrade. But if you calculate the IIP3 from 2 signals that are below (approx) -30 dBm, the IIP3 remains around +4 dBm"
Gerber files, Gerber version "RS2.74x"
The original Dubus article is here: Part one and Part two with permission of DUBUS-Magazine! An example of how to integrate it in a real world system can be seen here.